Dipping into the archives today. Enjoy a golden oldie! The hubby and I are big silent movies fans. It's interesting to watch movies that are 90 to 100 years old, and even more interesting to see how storytelling hasn't changed much. What worked back in 1920 still works today. 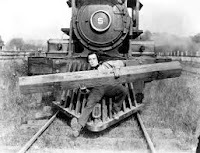 Filmed in 1926, the Buster Keaton film, The General, is an excellent example of tight plotting and storyboarding. Nothing is wasted in this film. If you see a detail on screen, you can be sure it'll come into play at some point. And the best part? They surprise you. I can't tell you how often the hubby and I laughed over something we said we should have seen coming. It's the story of Johnny Gray, a train engineer living in the South during the Civil War. He tries to enlist in the army but gets turned down, because he's more vital to the war effort as an engineer than a soldier. But he doesn't know that so he's seen by the girl of his dreams (and her family) as a loser. But when a Union plot to steal his beloved train (the General of the title) also kidnaps his girl, he strikes out to get back his train and save the day. When you have no dialog and the only way to communicate with your audience is through visual action and a few placards with text, you have to be clear. But don't think clear means simple. Silent movie plots can be just as well-rounded as today's movies. The difference is that they always know what they're trying to get across to the audience in every scene. Keaton's Johnny Gray had a clear goal in every scene of the movie. You knew exactly what he wanted and why. Every action and look was crafted so the audience could see the emotions and the goals of this character (show don't tell at its core). Because you know what he wants and why it matters, you're drawn into the story and care about this guy. The main plot of the movie is to get his train back, and the kidnapped girl is a subplot. But right at the start we see why both train and girl matter to Johnny Gray, and he takes great risks to bring them both home. He knows he's someone the army turned down, so he's feeling less than heroic. But these things matter to him and he'll stop at nothing to win. Because the goals are clear, the stakes are clear and personal. You want to see Johnny win and worry about him as he tries to get back his train. Small problems are all the more compelling because you know what he's risking to stop the bad guys. Without special effects to dazzle us, silent movies lived and died on the characters and what they did onscreen. You had to care about the hero, and Charlie Chaplin created an iconic character with his "Tramp," a central hero in many of his movies. (Just watch The Kid to see how lovable he is) Buster Keaton's characters shared many of the same lovable traits and brought audiences back for more. You went to these movies to see these actors and their characters. The plot was secondary. What make these characters so compelling is the same things readers look for in novels today. Relatable people with a problem that matters to them. Characters with a sense of humor who try to do the right thing (even if they aren't on the right side of the law). And there's always something they do at the start of every movie that makes you like and care about that character. Almost 100 years late,r and these elements haven't changed. At its core, storytelling is timeless. Characters we care about doing something interesting we want to see them do. I think with all the advice and craft tips on the web today, it's easy to get caught up in the minutia of the craft and forget the reason people tell stories in the first place. Silent movies clearly illustrate what's at the heart of every tale. Have you ever seen a silent movie? What did you think? One of my favorite silent movies is "The Eagle", starring Rudolph Valentino. For one thing, the villainness came pretty close to sympathetic herself. Chaplin's "The Gold Rush" was another; that man could simultaneously make you laugh and break your heart. Oooo! What a great idea...to go back to the silent films. I haven't watched any in ages. But I did watch "The Artist" last winter and loved it. We may not understand WHY the hero refuses to go with progress and join the talkie phenomenon (at least not until the end). But we are sympathetic to him from the beginning and when his star fades as the upstart girl's star is rising, we can't help but be sympathetic with his bitterness. When he starts wrecking his films, I was yelled "Noooo!" in the theater. Whoops! I was really into the story. Such great films out there and what a great post to help us see the writing craft in a new way. Thanks! Rachel, Gold Rush is actually on the to-watch list for this Friday. We watched Chaplin this past Friday (not silent, but we wanted to see it again) I'll have to add The Eagle to the list if it isn't already. Amelia, I loved The Artist, too. I did like how you wondered the whole time why he didn't want to talk. The stairs image, with him going down and her going up, was so beautiful. A great visual metaphor. Love this post. Such practical tips from an earlier age. I've been studying movies lately, but maybe it's time to try some silent ones! Debbie, I was surprised how well they hold up. And it's fun to think "that's the first time anyone probably did that gag on film." I haven't seen a silent movie in ages (other than The Artist)! The first one I saw was Metropolis when I was about 13; LOVED it. Perhaps I should re-watch it. You never know where inspiration will hit. Great post Janice! AJ, have you seen the remastered one? They found a lot of lost footage from around the world and re-cut the film. (it's 2.5 hours long, but had gotten chopped down to half that I believe). Apparently, when it was released theaters would cut it and after so many cuts the film no longer made sense. We watched that one a few Fridays ago. :) So cool how so many of the themes are still used today. I've only seeen parts of Cops and The General. I need to add The Artist to my Netflix queue. Love this post by the way. While reading Hugo Caberet, an homage to silent films, I wondered about this topic. I'm so glad you wrote this. I love this post. It's very interesting timing, because I recently heard a webinar from Angela Morrison on Plot, that she did with Writing for Children Live, and she recommended and discussed some books written for screenwriters for us children's book authors to use to help us with plot. So she recommended following the film world for ideas on how to better your own writing as well! Awesome! Lin, thanks! We've really enjoyed them. Kim, there's a lot of screenwriting tips that translate to novels. The Save the Cat books for instance. Hugely helpful. 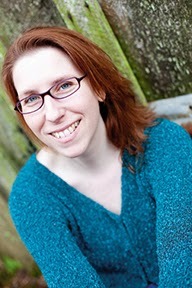 Alexandra Sokoloff writes a great blog that's about screenwriting and novels. Good stuff there. Sorry...tried to edit this comment and ended up deleting it. Here's the original comment! I love it. Great suggestions. I'm not a silent movie expert, but as a Buffy fanatic, I can say to watch "Hush," 2/3 of which is a silent TV episode. It presents a number of ways that creative writers can get across plot points without relying on exposition-heavy conversations. More interesting is that the episode is silent only in terms of dialogue, so it is not really a silent film person. The show still features music and sound effects, which become far more important without the dialogue. So even if you are just trying to experiment with fewer dialogue scenes you can watch the episode to get a good idea of how describing sounds can replace a lot of what you want to communicate purely through dialogue. Dedulysses, I LOVED Hush, What a great episode. Good tips about the sounds. Non-sight sense can add so much to a scene. Love silent films, whether The General, Metropolis, or even Noseferatu - studied early cinema when in my twenties and you are so right about the way they tell stories so well. Some real masterpieces and I suspect some of the best film-makers and writers learn from them. Eisenstein's films had some powerful moments - like the pram on the Odessa Steps in Battleship Potemkin.